One of the most fascinating bits of future tech on the radar is mid-air gesture control. (Think Kinect. 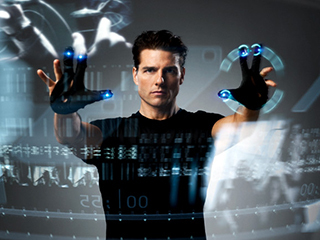 Or Minority Report‘s computing gestures.) 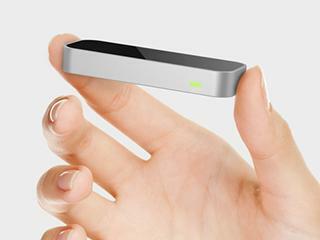 Leap Motion made a splash in 2012 by introducing an extremely accurate accessory that can read users’ motions within an interactive 3D space of 8 cubic feet. And unbelievably, the price is only $70 per preorder/unit. Most recently, the company has partnered with Asus, which will bundle its PCs with the wee little Leap Motion technology (below). Not to be outdone, Intel has several partnerships going for its “Perceptual Computing” initiative. Intel’s director of Perceptual Computing, Achin Bhowmik, unveiled a whole host of new features at CES (top, main) — including logging in via facial recognition, using gesture controls to execute computer commands, and even successfully playing Where’s Waldo, with a computer tracking his eyes as it found the correct spot on the screen. The motion/gesture features alone would be a cool departure for computer-using consumers. Though the system seems a bit limited right now, a major announcement like this suggests heavy development in this area. And it will need all the TLC it can get, with stiff competition like Leap Motion around. It has stunningly accurate technology that can detect each of your fingers, and distinguish them from, say, a pencil you hold in your hand. (Intel claims to have similar accuracy.) Designed for integration directly into computers, the company will make add-on units available later this year, so older laptops and ultrabooks can get in on the action. 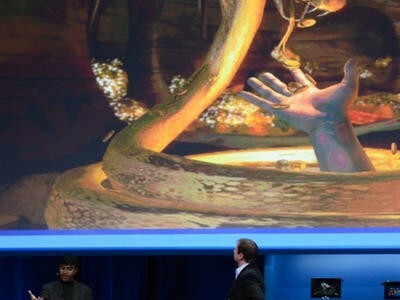 But Intel’s Perceptual Computing campaign isn’t limited to only gestures. The goal is to provide direct, natural human-to-computer interfaces, which also encompasses next-generation voice command and control. That’s firmly in partner Nuance’s wheelhouse. As such, the company is imbuing Dell computers and, soon, other PC makers with robust, natural speech voice features. (That’s not all Nuance is into: Word has it, it’s gracing all sorts of products, from phones and TVs to vehicles.) For its part, Dell is also delving deep into facial recognition and movement-tracking technology, as well as releasing computers with Intel’s 3D-gesture control baked right in. You could say this endeavor is sort of like Siri, Face Unlock and Kinect, all mashed up together to create one super-futuristic style of organic computing. And why not? Sure, other devices have been able to make it fly on various levels, but PCs have the computing power to make it soar. Of course, the Gen Ones need to hit the market first, and the companies will have to polish any rough edges. Still, it could be the injection that the PC industry so desperately needs. So much of the tech buzz has been about smartphones and tablets for so long now, and with overall sales slipping in the computer industry, things have been looking pretty glum in this department. But once the public gets a gander at what is possible with their trusty laptops and ultrabooks — in gaming, engineering, graphic design and other fields — that’s when the rubber will meet the road. Both Intel and Leap/Asus have SDKs, so it won’t be long. Can Perceptual Computing save PCs? If so, which would you be most interested in? Intel or Leap Motion/Asus? Here are a couple of clips on Leap’s technology — the first from last summer, courtesy of The Verge, and the second, a demo vid of a game called Block 54.